Every once in a while, when a special occasion or impulse arises, I look for a nice restaurant where I can splurge a little and treat me and my guy to some fancy plats. Since these are rare occasions, I usually spend the entire après-midi scouring Paris food blogs like John Talbott's Paris, David Lebovitz, or Girl's Guide to Paris looking for the perfect spot to dine the night away. Oftentimes while scanning restaurant reviews I am a bit slighted by the fact that the 18th, my home for the past 4 years, is snubbed and considered a trek for many not-so-intrepid foodies. While a few restaurants will be noted by reviewers who have the courage to make it up the hill, the collection of haute cuisine addresses remains concentrated in central Paris. Les grands restaurants may be more likely to make their home in arrondisements 1 through 7, but I'm just as happy dining in the 18th and contrary to popular belief, one can find pretty fine dining for half the price in the charming streets near Montmartre. In fact, that's something I really love about this quartier. Even after living here for a few years, I'm still finding new bonnes adresses, many of which are bio. 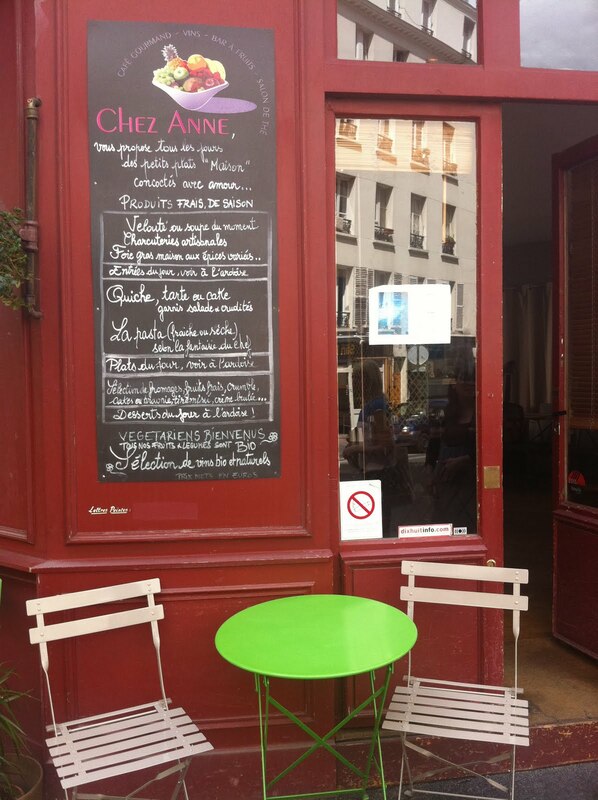 My newest discovery, which fits under both bonne adresse and bio categories is Chez Anne, a friendly neighborhood restaurant which offers organic fruits and vegetables and a wide selection of biodynamic wines as well. 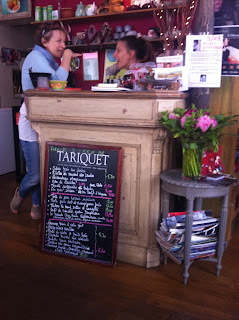 While the chalkboard invites vegetarians by name ("Vegetariens Bienvenue"), omnivores of all types are welcome. The menu is varied to include several strictly vegetarian options mixed in with French carnivore classics like Canard and Boeuf Tartare. Chez Anne may be more well known for its brunch (served every Sunday from 12h-16h) but when I stopped by for a weekday lunch I found the place subtly abuzz with small groups seated at every other table. The lunch menu is very reasonably priced, with three prix fixe options; 13 euro for the tarte du jour and a coffee, 15.50 euro for entrée + plat or plat + dessert, and 18 euro for all three courses. I opted for plat + dessert once I saw that Pasteis de Nata was an option. I love this portuguese pastry and hadn't had one since I visited the Marché St. Quentin in February. But before I got to the dessert, I was pleasantly surprised with a large serving of pesto pasta served with fresh organic mushrooms and accompanied with roquette. Done in a way that would make any Mediterranean proud, this Summer dish was lovingly soaked in olive oil and a perfect pick-me-up on an unseasonably chilly afternoon. Stacey got the tarte du jour (spinach and chevre) which was accompanied by a large salad and was sprinkled with roasted sesame seeds. For dessert, the pasteis lived up to my expectations (I ate it with my hands- is that rude?) and was served with nature-sized strawberries (does anyone else get creeped out by the unnaturally enormous strawberries that are sold in stores today?) and a slice of kiwi. We didn't try the wine- this was a business ladies lunch, we are very serious business ladies- but at this point in the meal I felt a bit inebriated on good, organic and seasonal food. So thanks for that, Anne! I will surely be back for brunch and I suggest all readers to take a hike to the 18th and to Chez Anne!